colors on wove japan paper. Signed and numbered 27/100 in pencil. 18 3/4 x 15 11/16 in. ; 47.63 x 39.85 cm. John Wesley Cotton, painter and etcher, was born in Canada, but he lived in southern California during the teens and twenties. His art training began in Toronto at the Art Students League in 1886, followed by studies at the Art Institute of Chicago. Until 1915, he spent time in London, Belgium and France, where he perfected his technique of inking à la poupée on aquatinted surfaces, in the European manner. He produced a body of work devoted to the picturesque landscape of Europe. This print is his most accomplished and adopts the style and subject matter of the Arts and Crafts movement. 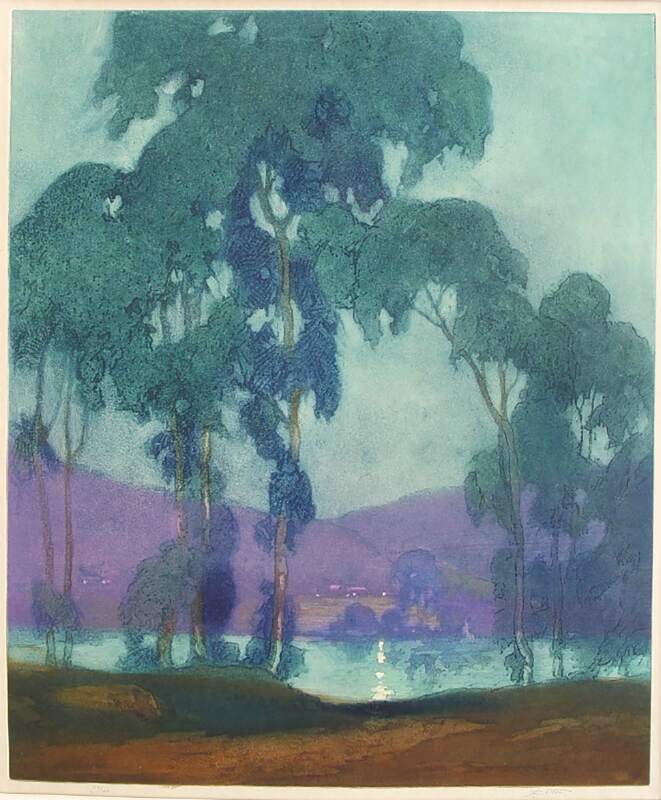 He won a medal for his etchings at the Panama Pacific International Exposition in 1915 in San Francisco, and about three years later, moved to Glendale, California. He was a member of the California Printmakers Society and the California Watercolor Society. His works are in the collections of the New York Public Library, Library of Congress, National Gallery in Ottawa, Toronto Art Museum, and the Oakland Public Library.